Reports about Facebook’s and Google’s nascent battle against purported “fake news” must be considered in solemn gravity — not because there are bogus articles circulating — but because, in actuality, it constitutes a war on legitimate, factual information and dissenting opinion. Certainly, many of us grumble when an article about aliens invading New York City passes through our newsfeeds only to be taken seriously — but the so-called “problem” of “fake” news Facebook’s Mark Zuckerberg is referring to isn’t targeting such vapid content. What Facebook will target, however, should concern all of us. After the absurdity that was the 2016 presidential election, Hillary Clinton supporters and establishment Democrats excoriated Zuckerberg for dereliction of duty in failing to remove sham news articles and sites from his wildly popular platform — because, in their eyes, this putative “fake” news literally swung the election toward Donald Trump. But this seemingly hapless campaign of finger-pointing — the Clinton camp also railed against FBI Director James Comey, among many others, in their search to blame anyone but themselves — has nothing at all to do with inane articles of no worth. Rather, the new war on “fake” news is simply a poorly-disguised attempt to quash legitimate information unfavorable to the liberal establishment’s agenda — for good. This perilous course of blanketing, State-sponsored censorship marks what might be the most overarching effort to kill dissenting opinion in decades — perhaps approaching or exceeding the height of the Red Scare and McCarthyism. Mark Zuckerberg, a known proponent of establishment narrative and supporter of liberal goals, originally responded to this criticism somewhat rationally, saying the actual percentage of imposter news items is so miniscule, it could not possibly have affected the outcome of the election. He’s right. Or at least, he was. It’s imperative to consider several points concerning Facebook’s burgeoning war — with over one billion users worldwide, no staff would be large enough to combat reports of fraudulent news that will undoubtedly be rolling in soon. So, the plan? Artificial intelligence — a self-teaching algorithm to identify and remove the supposedly counterfeit news items, and likely relegate the source as a Scarlet Letter verboten site. But an issue of grave concern has already arisen before the war on fake news even gets off the ground. Business Insider boasted in a headline “It took only 36 hours for these students to solve Facebook’s fake-news problem” — but there’s a serious problem. Their algorithm failed. Miserably. In fact, one of the two items touted by Business Insider as proof of the success of the spurious news-slaying algorithm can be proven factually true — nearly verbatim — on the government’s own website. “It classifies every post, be it pictures (Twitter snapshots), adult content pictures, fake links, malware links, fake news links as verified or non-verified using artificial intelligence,” one of the students told the outlet. Appearing smug in the article’s lead picture, Nabanita De, a second-year master’s student in computer science student at UMass Amherst; Anant Goel a freshmen in Purdue University; Mark Craft, a sophomore at University of Illinois at Urbana-Champaign; and Catherine Craft, a sophomore also at the University of Illinois at Urbana-Champaign, all believe they’ve discovered the quick fix to Zuckerberg’s [now] problem. 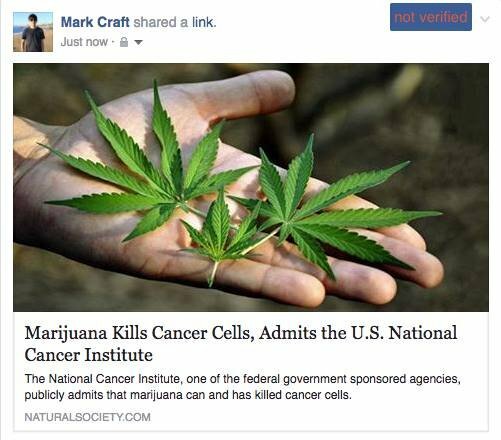 As an example, the extension identified and marked an article “not verified”; but the article, a report touting findings from the National Cancer Institute which appeared on the government’s National Institute on Drug Abuse site — “Marijuana Kills Cancer Cells, Admits the U.S. National Cancer Institute” — isn’t fake at all. “NIH-funded and other researchers are continuing to explore the possible uses of THC, CBD, and other cannabinoids for medical treatment. Beyond this one example, and much further to the point, the Democratic establishment is leading the call to abolish “fake” news — a blaring alarm bell for anyone paying attention this election cycle. A trove of published leaked emails and documents by Wikileaks concerning the Democratic National Committee, campaign chair John Podesta, and Hillary Clinton, proved a staggering degree of corruption and collusion undertaken for years by establishment insiders and corporate media, which, for all intents and purposes, amounted to an attempt to throw the election in their favor. As the campaign came under heavy fire from all sides, Clintonites were quick to shift blame and try to discredit the mountainous evidence of wrongdoing — first by blaming Wikileaks for trying to throw the election, then by claiming the information being published was fake. For nearly the entire duration of its existence, Wikileaks has offered a prize of several hundred thousand dollars for anyone who can prove even a single document it published isn’t authentic. And that bounty, though challenged from time to time, remains unclaimed. And now the outgoing Democratic party wants to initiate a war on fake news? Nothing to see here, folks. In fact, evidence of corruption, media collusion, and highly questionable, if not explicitly criminal, activity now mar Hillary Clinton’s legacy as Secretary of State and 2016 Democratic nominee — not because of bogus reporting. There was no need for fake items, and — although a few websites certainly blew points out of proportion — the emails, themselves damned Clinton’s campaign. Thus, the liberal establishment’s war on fake news — for which the head of the largest social media platform has now been roped in — amounts to little more than a witch hunt to silence truthful, but damaging, information. Information vital to the American public, imperative for making informed choices, and indispensable if this nation is still to be characterized as maintaining even a shred of freedom. Employing failed algorithms — or even people — is a hopelessly flawed solution to a problem that simply doesn’t exist. And what will result is a war on alternative, independent media and opposing thought — in all forms. Considering the insidious, wholly one-sided nature of this plan, it would be errant not to draw parallels to a new McCarthyism. Indeed, independent media websites likely did help turn the election away from Hillary Clinton — not by posting inane, false garbage, or slanted reporting — but by having the integrity to post the truth about her dealings behind the scenes. And, where corporate media failed in journalistic integrity and due diligence, alternative sources — led by Wikileaks — excelled. Had the same vault of information surfaced about Trump, alternative media would have had the same field day — and that’s where the Clintonites have it all wrong. Fake news — dissenting opinion, opposing viewpoints, a free press — none of that tilted the election. Unless, of course, by fake news they are referring to corporate media’s submitting articles to the Clinton campaign prior to editors, or Hillary insiders collaborating on articles so ensure the ‘right’ angle was employed — or any of the examples proven in leaked documents. Nominating Hillary when a veritable revolution erupted behind Bernie Sanders, however, did. It would behoove them to turn tail, learn the lesson, and walk away, instead of imposing a blanketing and unnecessary campaign of censorship against “fake” news when the truth is a bitter pill to swallow.